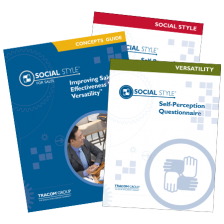 The paper based SOCIAL STYLE® Self-Perception Questionnaires and Sales Concept Guide combines the SOCIAL STYLE Questionnaire and the Versatility Questionnaire with a sales specific Concepts Guide. Providing in depth information about the assertiveness and responsiveness dimensions, the guide will help sales professionals identify and appropriately respond to their customers’ SOCIAL STYLE. The Concepts Guide provides an overview of the SOCIAL STYLE Model in the context of effective selling to helps sales professionals understand their own behavioural style and the styles of others. The Sales SOCIAL STYLE Self-Perception Profile measures a salesperson’s SOCIAL STYLE and Versatility using an online self-assessment. The profile report is unique to the roles and responsibilities of a sales professional and uses norms of other sales professionals. The Improving Sales Effectiveness with Versatility (ISEV) Concepts Guide is included with the profile. 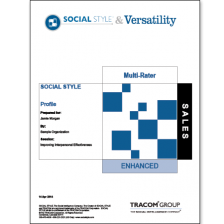 The Sales SOCIAL STYLE® Multi-Rater Profile provides the most comprehensive picture of a person’s SOCIAL STYLE and Versatility. It uses an online multi-rater questionnaire and provides a detailed report on the four components of Versatility – Image, Presentation, Competence and Feedback. This report is specific to the roles and responsibilities of a sales professional. It is written from a salesperson’s perspective and is scored against sales norms. The purchase of a TRACOM course, content or content license is required when purchasing this profile. Certification is also required when using a Multi-Rater Profile. 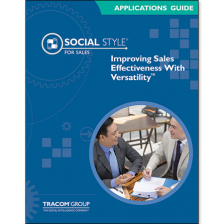 The Sales Applications Guide helps sales professionals apply their knowledge of SOCIAL STYLE® to the specific tasks of selling. It addresses activities including building rapport, dealing with questions, overcoming objections and closing the sale. The Applications Guide is designed for the salesperson who has previously learned the concepts of SOCIAL STYLE. 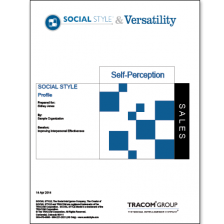 TRACOM’s Sales SOCIAL STYLE Self-Perception Administration Kit is a single resource to enable trainers and facilitators to quickly teach a sales-focused SOCIAL STYLE class. It provides relevant SOCIAL STYLE background, information about the SOCIAL STYLE, the SOCIAL STYLE Model and sales-specific assessments. It includes recommended course content for two-hour and four-hour training courses, along with our SOCIAL STYLE & Versatility Facilitator Handbook. The material covers the information necessary for salespeople to develop mutually productive relationships with their customers and prospects. 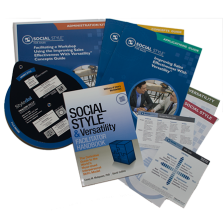 Purchasing this administration kit qualifies the facilitator to become a SOCIAL STYLE Accredited Instructor. Details regarding the accreditation process will be emailed to you after purchase.